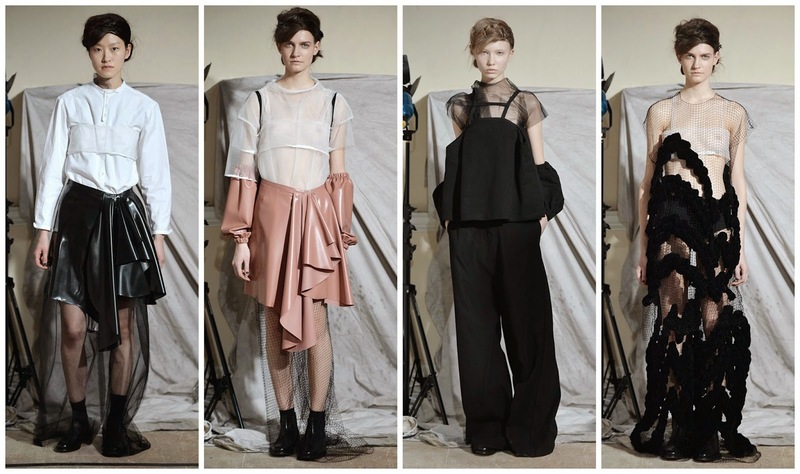 6 designers took over the BFC Presentation Space off the River Terrace in the New Wing of Somerset House. The compact venue hosted six static presentations, with two shows a day for three days lasting two hours each. It was quite amusing to see the set of each show change from starry planetarium at Shrimps on Friday to a sophisticated art class at Molly Goddard that evening. Faustine Steinmetz’s Thomas Petherick-commissioned wooden capsule set was changed two hours later for Danielle Romeril’s blue beach hut and gloomy grey sand. Claire Barrow showed on Sunday morning with models standing on platforms and the final presentation that evening was from my personal favourite, Phoebe English. A makeshift set of a grey curtain, professional photographer studio lighting and a metallic fan all lined the runway. Sensuality was pivotal here. With a harsh, blunt edge of course. Sheer dark skirts were bundled up with black coats. Rubber/latex-esque skirts gave a tied at the waist effect over a leather and sheer skirt. A light collarless shirt with a sheer bandeau gave a light touch to the the monochromatic look. Colour came via the flesh coloured Look 6. The sheer blouse was worn with rubber/latex elasticated sleeves. A matching skirt cascading drape in the centre was gorgeous. The netted skirt underneath was black and this soft goth had the seasons 90’s grunge revival all over it. The fish nets were particularly menacing. The Phoebe English girl was a goth but there was a sinister vibe in the air. The giupure d’art lace technique that Phoebe explored last season was once again present. The fluctuating pattern the look took was a rise and fall between dark aesthetic mixed with the soft make-up, sheer bandeau and netted short sleeved top. More rubber/latex took to the presentation. The sleeves that we have seen in the collection is a stylish undercurrent we have seen in this collection. Who knew someone could make arm warmers fashionable. With a whiz like Phoebe, I’m not too surprised. This black, white and flesh coloured freshman season on-schedule presentation from Phoebe improved upon her debut on the digital schedule last season. This sensuous outing was stylish and will no doubt be a sell out in Dover Street Market, a primary stockist of hers. I like the somewhat short gap between September and February London Fashion Week’s, but I’m not too fond of the two month extension between the already five month gap of February to September. I simply cannot wait for the next Phoebe English collection.